Exellent service will definately use them again. Great service, this was my first order and 10 out of 10. Bought in July as a leisure batery for a motorhome and, so far, I've been very impressed with this batteries ability to hold its charge. Easy to install and relaible in operation. Fast reliable delivery with accurate time slot adhered to (even though we live in the sticks). Both batteries were fully charged and although early days yet, have lived up to expectations. Excellent service and delivery. Decided on Bosch brand because spec quotes 'B' rating for leisure industry, however I firmly believe this is the same battery sold by Varta LFD90. 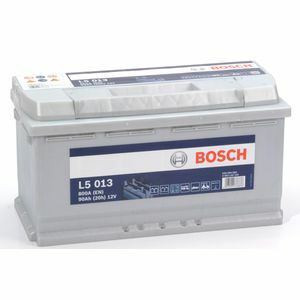 Bosch battery has been installed in camper van for couple of weeks and performing well. It is difficult to give a review on the battery as it was only installed 2 weeks ago to my motor home and as yet has not been tested on holiday. I have given 5 stars purely on the back of Tanya batteries excellent service. On the negative side, I did not receive any sort of Installation/maintenance manual. Purchase and delivery could not be better. Just what we were looking for at a great price. Best thing since sliced bread for Motorhome and Caravan General or Inverter power they have performed as expected from day one with no voltage dropping or capacity issues great service and great batteries,Thank you. B.R.Barclay.